One of the more welcome signs of spring arrived last week: Penn State’s week-long Spring Break. Deborah and I headed 1600 miles west and south to sunny, but not yet quite warm Albuquerque, New Mexico to visit our daughter and to do some hiking in the high deserts. (photo by D. Sillman). Our first morning was cool and gloriously sunny. 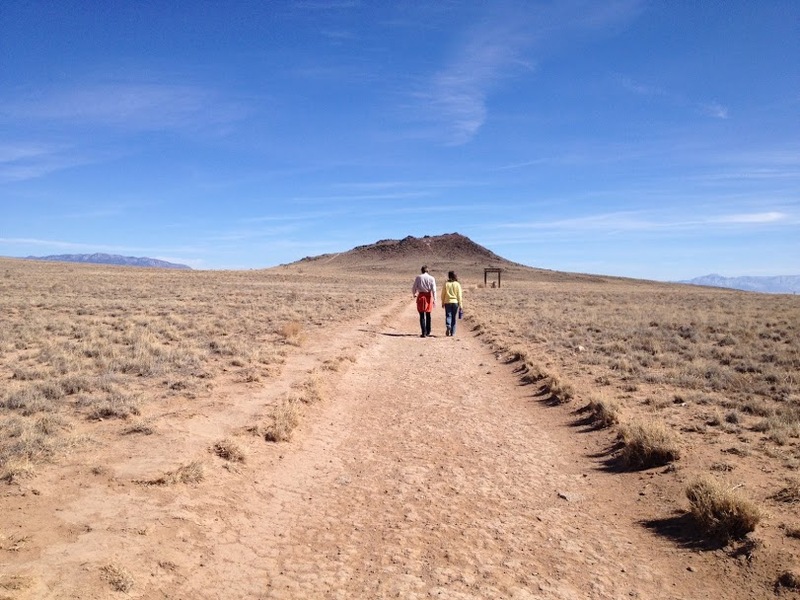 We walked east from our daughter’s apartment toward the campus of the University of New Mexico. Our nature observations began immediately upon stepping out the front door: in the London Planetree across the street were my first two robins of spring! They chirped and called to each other for several minutes and flew off to grace some other street corner and some other observer. We walked several blocks past the typical Albuquerque houses: low, adobe-style homes painted in varying shades of tan. Many of the houses had small, front “lawn” squares that were mostly bare soil or carefully raked gravel. Some of the yards had honey locust or London Planetree growing in them. There were a few with some unknown (to me) thorny shrubs, too. There was very little grass, and what was there was dry and winter-brown and well covered by dry, brown tree and shrub leaves. This all changed when we got to the campus. Apparently, the University of New Mexico has its own aquifer and, so, is not bound by the logical water restrictions that the rest of Albuquerque has to adhere to. Stepping into the campus grounds was like walking into a different climate zone. There was no bare soil or gravel or stones. Instead there was a continuous carpet of winter-brown grass and dozens and dozens of trees some of which should not have been growing within a thousand miles of here! There were honey locusts and London Planetrees just like in the surrounding neighborhoods, but there were also green ash, eastern red buds, black pine, and weeping willows! I did find pinyon pines, Ponderosa pines, Colorado spruce, and some hearty looking junipers scattered about among these eastern, Asian, and European tree species, but the managed, non-desert appearance of the campus was startling. The duck pond, though, was delightful and the ducks clamoring for bread crumbs and the turtles and orange carp gliding past were peaceful and wonderful to watch. But how could this be occurring here? The water cost and the resource extravagance were unsettling to think about! In the afternoon we drove west out of town and went for a walk down a broad, circular canyon whose walls were marked with a series of 400 year old rock etchings (“petroglyphs”). (Image: D. Sillman) The canyon walls were about 60 feet tall and were mostly made up of great tumbles of black, volcanic boulders. The floor of the canyon was quite flat and consisted of soft, sandy soil punctuated with a recurring, geometric pattern of sagebrush, cactus, and tumbleweeds. In places the trail had been worn down into loose, ankle deep, dune sand. Animal tracks crisscrossed the trail: jackrabbits, coyotes, small rodents and lizards. Occasionally, we saw a freshly dug burrow in the sand at the end (or the beginning?) of one of the tiny trails. The glory of this trail, though, are the etchings on the flat surfaces of some of the great, black boulders. They were made by the indigenous people of the area four centuries ago. Their meanings and purposes are not known. There is no key or written tradition by which we can translate them, you just have to look at them and use your imagination. The running man, the sun, the turtle, the snake, the coyote, the spiral, the turkey, and a whole set of abstract possibilities draw you along the canyon trail and back into a forgotten time and place. Maybe this canyon was a meeting place for the surrounding people. 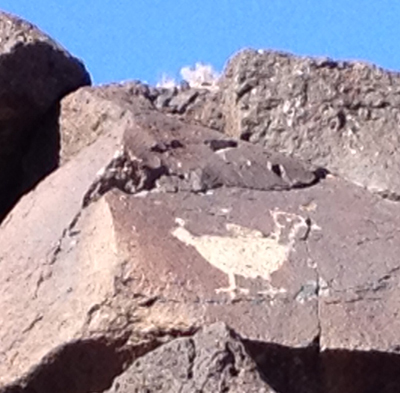 Maybe these petroglyphs marked traditional camping or trading spots. Maybe they formed a religious path over which observant people walked and prayed. Maybe they were comedic graffiti. Like any art, you can take them into your mind and let them grow in any number of directions and ways. We reached the turning point deep in the canyon and took a return path that ran down the middle of the canyon floor. It was getting close to 4 pm and the sun was starting to drop close to the top of the enclosing western ridge. It would get cold quickly after the sun went down, so we hurried along to get back to the car. As we reached the middle of the bowl of the canyon we heard just ahead, up in the loose boulders of the canyon wall, a lone howl of a coyote. We stopped and listened, and the coyote called again. This time he was answered by another coyote up in the canyon wall back behind us, and then this second coyote was answered by a third coyote off to our left. These three groups called to each other for about ten minutes and then were quiet. I have to admit to a funny, irrational feeling that accompanied these coyote calls. I felt that we were surrounded, and that the coyotes (who would never actually approach a human being) were hunting us. They were not doing anything of the sort, of course, but I really admired both their invisibility and their boldness! It had been a very exciting first day experience in the desert ecosystems of the great southwest! This entry was posted in Bill's Notes. Bookmark the permalink.